And there you go. Time is not a dimension. Another dimension would have to be something we have no understanding of. Oh! I'll paint the "greetings from the past" banners, you bake a cake. But Time is its own dimension, not the 4th spatial one. It effects every spatial dimension. The 4th dimension flatland talks about is a 4th spatial one. But it's still a dimension. And if it really matters, it is very possible to think of time spacially. Every human would look like a long worm as everything they ever do is visible. Time only goes one way. No spatial dimension we know of does. Is it a terrible leap of logic to say that time isn't a spatial dimension? Time is a dimension, but not a spatial dimension. I know, all I said was it is possile to think of time as a spacial dimension. i read flatland.. made me brain hurt for a bit. Have any of you read the other flatland? The one in which a normal man is visited by a 4th dimensional creature? It ain't written by the same guy, you know. Yeah. In "A Brief History of Time", Stephen Hawking says that 2-dimensional creatures would be nearly impossible, as they would have to climb over each other if they lived on a planet with a 1-dimensional surface, and a digestive tract would split them in two. It's an analogy though. So it doesn't really matter. Plus, they can't go over one another, since that would imply a depth dimension. That's not to say that 2D space in the real world is an impossibility. In fact, (I may have mentioned this before) electrons in between graphite sheets behave very much like 2D particles. I think the term for these special particles is anon. Here's a picture to chew on. 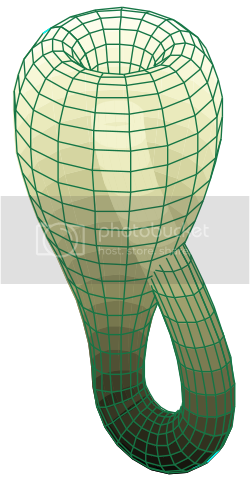 This is called a Klein Bottle. It's like a Moebius Strip, in that it has only one side. However, you notice that it intersects with itself. This is due to the fact that it was "immersed" in 3D space, whereas in 4D space it would not intersect with itself, since the neck would be "lifted" into the fourth dimension and then placed back.